BMW has updated the 3 Series range, right at the time that Jaguar has put a brilliant new rival on sale in the form of the XE saloon. The 3 series gets a gentle visual makeover, higher quality materials, a very frugal three-cylinder turbo engine taken from MINI - plus a plug-in hybrid model with startling efficiency. 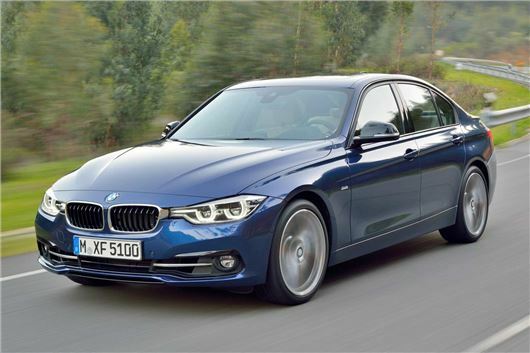 Beginning with the hybrid, the 330e doesn’t go on sale until 2016 but will prove a win-win 3 Series, assuming the price isn’t stratospheric, by boasting 252PS yet a claimed 134.5mpg and 48g/km CO2. Closer to the present, the three-cylinder MINI engine slots into the base model 318i, which will replace the 316i when the updated 3 Series hits showrooms this July. The new 318i returns a highly respectable claimed 52.3mpg and 124g/km CO2 – or a couple less with an automatic gearbox equipped. Elsewhere, the entire engine range has been tidied up for improved emissions and economy. Once again the 320d ED (Efficient Dynamics) model is the most frugal, returning an official 72.4mpg and 102g/km. However, to dip into the VED-free zone with that car you’ll have to specify an automatic gearbox, which lowers CO2 to 99g/km. A new four-cylinder petrol engine with 184PS now powers the 320i model, which is 14PS more powerful than the outgoing car but more efficient, returning an official 48.7mpg average (or 51.4mpg with an auto). And there’s a new 340i, which is the six-cylinder bridge between your run-of-the-mill 320i and a full fat BMW M3. It has 326PS and will hit 62mph in 5.9 seconds, while at the diesel end of the six-cylinder performance spectrum the 335d does it in 4.8 seconds yet returns 10mpg more, with a 51.4mpg average rating. Over 14 million 3 Series models have been sold since 1975, so BMW is not about the go revolutionary with the styling, and has approached the update by revising very slightly the headlights, which now include LED indicators and LED daytime running lights, and broadening the air intkes. At the back, the tail lights are now full LED setups as standard, in keeping with current rear light trends. There are new wheels, too. Inside, the cabin gets chrome accents, the stereo surround is finished in gloss black as standard and there’s more storage underneath the centre console, plus a couple of additional cup holders. BMW is expected to announce prices within the next month or so, with the car coming in July in both saloon and Touring (estate) forms. Anticipate small like-for-like increases over today’s car, meaning a £25,000 starting price for the MINI-powered one.